Phitsanulok is a city in lower Northern Thailand. It is not very popular with tourists – most just pass here when they take a train ride to Chiang Mai, which is further up north, or when they go to Sukhothai or Kamphaeng Phet. Apart from the popular Wat Mahathat temple in Phitsanulok, one of the most interesting things here is the Folklore Museum. Here, you get to see traditional Thai local life. Nowadays, this is becoming more and more difficult to see in Thailand. Everything is becoming more modern, and that is good of course – it is more convenient living. But some of the good things of the old ways get lost – and this is a place where you can still see those things yourself. There are many wooden pavilions here, in which you can see many aspects of traditional Thai life. For example, nowadays, kids play with Nintendo Wii, and computer games, and iPhones. But in the Phitsanulok Folklore Museum you can still see traditional toys of Thailand, made from natural materials, without flashing lights and digital sounds. Another thing that is very interesting about this place is the Buranathai Buddha Bronze-Casting Foundry. 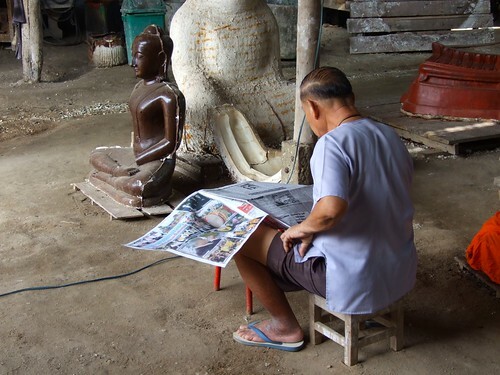 Here you can see how Buddha statues are made. Some are small, some a very large. It is good to come here with a personal tour guide. The people who work here are busy doing their job: making Buddhas. With a guide, you can get explanations about the different steps that are involved in this.